"Simon's company and expertise as a rat catcher were invaluable during the months we were held captive. During that terrifying time, he helped boost the morale of many young sailors, some of whom had seen their friends killed. Simon is still remembered with great affection." 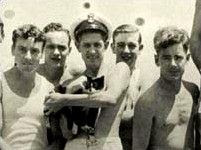 Courageous little Simon has been dead for fifty-eight years but his memory lives on in the hearts and minds of his shipmates from the HMS Amethyst. 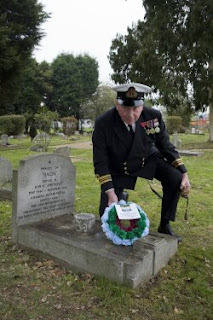 Most poignantly, Royal Naval officers gathered at his grave in Ilford, Essex, on November 1st for a wreath-laying ceremony. 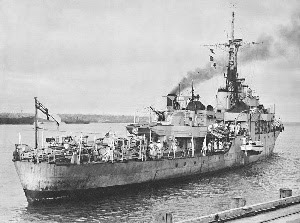 On April 20, 1949, the HMS Amethyst was on its way down the Yangtze from Shanghai in order to relieve the HMS Consort, which was guarding the English Embassy in Nanjing, when it came under sustained attack from the People's Liberation Army (PLA). The sloop, which sustained more than fifty hits from the rebels battling Chiang Kai-shek's Guomindang for supremacy on the mainland, finally ran aground on Rose Island with twenty-two dead sailors and another thirty-one wounded. The Amethyst remained under PLA guard for one-hundred-one days until it slipped its anchor on July 30th and made a daring one-hundred-four-mile nighttime dash down the Yangtze in the wake of the merchant vessel, Kiang Ling Liberation. Three prior rescue attempts had cost the lives of an additional twenty-four English sailors. Since Mao's boys had attempted to starve out the crew, food was not only always in scarce supply but constantly under attack from hordes of mice and rats. Luckily for the sailors, Simon was on board. Although wounded by shrapnel and singed, he nonetheless kept the ship's stores of dwindling food safe from rodents and helped to sustain morale among the sailors during the long siege. She went on to state, "The fact his name and story live on helps ensure that the men who sadly lost their lives in the incident are also not forgotten. The power of animals to sustain morale in times of conflict can never be underestimated." 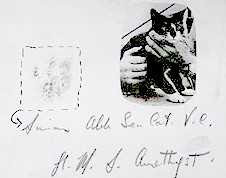 By the time the HMS Amethyst made it back to Portsmouth on November 1, 1949, the black and white cat was already such a big hero that Hett was assigned to reply to the hundreds of letters that he had received. (See photo below of him and his paw print on what looks to be a postcard.) Malheureusement, the story did not end happily for the brave little cat. Instead of being given the hero's welcome that the so richly deserved, Simon was whisked away from his shipmates and placed in quarantine where he died a few weeks later. Although the official cause of death was said to have been complications resulting from his wartime injuries, his shipmates instinctively knew that he had died of a broken heart. There probably is not anything more idiotic than quarantine rules which mandate that animals entering a country must be confiscated from their guardians and placed in solitary confinement for a month. People spread all sorts of deadly diseases and they are never quarantined unless it is known beforehand that they are contagious. Cats, dogs, and other companion animals are instead adjudicated guilty of being germ carriers without a scintilla of evidence to support such claims. Besides, thirty days is a ridiculously long time to quarantine an animal. On a practical level, animals are far more likely to become ill in quarantine than almost anywhere else. Nonetheless, that was the thanks Simon received in return for his stellar service to both king and country. The English have, however, attempted to atone for their ingratitude and cruelty. Upon his death, Simon was buried with full military honors. Later, he was awarded the Dickin Medal, the equivalent of the Victoria Cross, by PDSA. The medal is named in memory of Maria Dickin, an animal welfare pioneer, who founded PDSA in 1917. In addition to Simon, who is the only cat to have been so honored, twenty-six dogs, three horses, and thirty-two messenger pigeons have been recognized. At its cemetery in Ilford, PDSA provides a final resting place for three-thousand animals, including a dozen Dickin Medal award winners. Perhaps even more important, it spends around $74 million each year treating an average of four-thousand-six-hundred-fifty animals each day. With two-hundred-thirty fully qualified veterinarians and two-hundred-fifty-seven nurses it is the largest private veterinary operation in Europe. Fans of old-time radio will remember the Amethyst from an October 22, 1951 episode of Suspense entitled "Log of the Marne." In 1957, a movie was also released about the Yangtze Incident that, incidentally, featured the sloop itself. It was variously titled "Yangtze Incident: The Story of HMS Amethyst," "Battle Hell," "Escape of the Amethyst," and "Their Greatest Story." 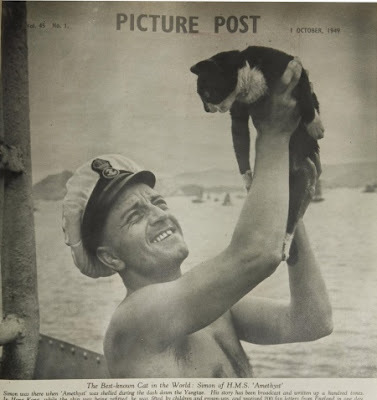 Photos: PDSA (Hett at Simon's grave and sailor holding cat aloft), Daily Telegraph (sailors with Simon), HMS Amethyst Archive (Simon's photo and paw print), and Wikipedia (HMS Amethyst).